Where do I belong? Does anything belong to me? No shot is fired, no one is physically hurt. People queue up for check-in with no visa in hand. No one had a visa; world citizenship each like to harness. Some of these stories are sexually sensitive and guidance of mature adults might be needed in comprehending them. The characters are all very common men and women; none of them might have done any exemplary work to make this world a bit different. They all lived by the rules and regulations of the world and they responded to the opportunities and threats of their land. They all wanted to be loved by someone; they were all looking for someone they could love. In some world, they cannot live if not loved by at least a few; life has no meaning without love. In some other world, love is not a necessity, life has lots to offer even when you cannot win the scarce love. People are made to be loved and things are made to be used; but more often things are loved and people are used. 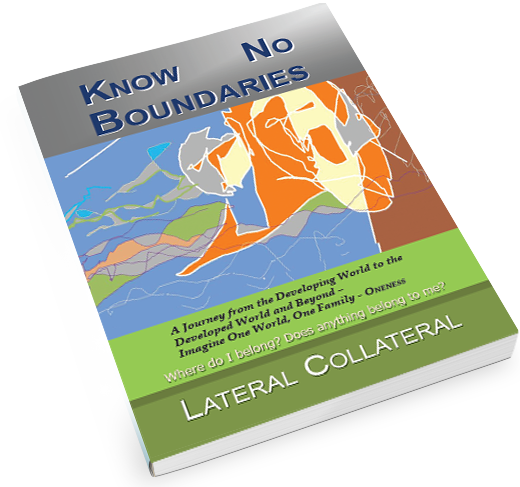 Find out more about these different worlds and get to know the characters through the pages of KNOW NO BOUNDARIES. Copyright © 2013. Lateral Collateral. All rights reserved.